#IDoDoIBook I Do! Do I? Kasturi Shukla is all set to marry the man of her dreams. Time to stop doing silly things and start living happily ever after, right? Well, then maybe someone should tell Kasturi that. This irrepressibly irreverent and not - quite - beaming bride - Read More.. 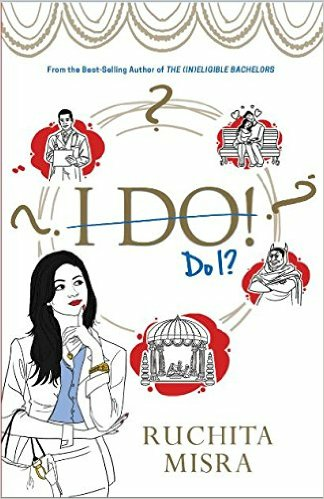 Reviews of I Do! Do I? Hash title I Do! Do I? Description Kasturi Shukla is all set to marry the man of her dreams. Time to stop doing silly things and start living happily ever after, right? Well, then maybe someone should tell Kasturi that. This irrepressibly irreverent and not - quite - beaming bride - to - be fumbles through a messy engagement and, in a moment of indecision, steps across a line that she should never have been near. To make things worse, her best friends are now nauseatingly mushy star - crossed lovers, her future mother - in - law thinks the kitchen - phobic Kasturi is a fabulous cook, her colleague Padma hates her for no reason, her boss wants medical intervention for her imaginary deafness and her mother has become a cyber - celebrity. This was not the way things were meant to go. Smart, hilarious and utterly unpredictable, I Do! Do I? will have you at the edge of your seat - unless you've already fallen off it laughing. Kasturi Shukla is all set to marry the man of her dreams. Time to stop doing silly things and start living happily ever after, right? Well, then maybe someone should tell Kasturi that. This irrepressibly irreverent and not - quite - beaming bride - to - be fumbles through a messy engagement and, in a moment of indecision, steps across a line that she should never have been near. To make things worse, her best friends are now nauseatingly mushy star - crossed lovers, her future mother - in - law thinks the kitchen - phobic Kasturi is a fabulous cook, her colleague Padma hates her for no reason, her boss wants medical intervention for her imaginary deafness and her mother has become a cyber - celebrity. This was not the way things were meant to go. Smart, hilarious and utterly unpredictable, I Do! Do I? will have you at the edge of your seat - unless you've already fallen off it laughing. Name I Do! Do I? No reviews available for #IDoDoIBook, Do you know I Do! Do I? ?, Please add your review and spread the good things.